I wasn’t quite sure what I wanted to cook today, until yesterday. I was running some errands for Jodi, and was at a grocery store. I saw some pre-made, bake-them-yourself calzones, and they looked really appetizing, even in their uncooked state. For a long time, I’ve wanted to try a pizza with a crust on the bottom and on the top, and so, for today, I thought I’d do it with the calzones. It ended up being a pretty involved two-day affair, because I decided I wanted to try an overnight rise on the crust. I also did the preheating of the dutch oven on the sauce. I found it did wonders for the patina (which was getting a bit thin on that oven), even just in one use. I’m becoming more and more convinced. 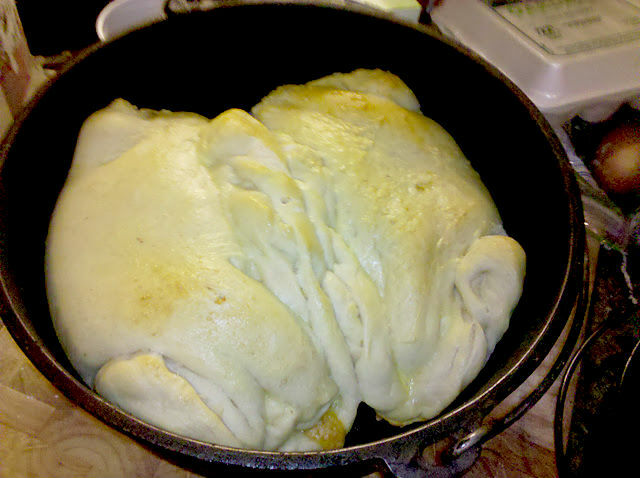 Of course, when I baked the calzones, I had to assemble them in the 12”, so I couldn’t pre-heat it. But with breads, you’re baking drier ingredients, so it’s going to strengthen your patina, anyway. Like I said, it all started last night. I have read a lot about how the longer overnight rises are better for pizza, and I thought I’d try it that way. Spoiler alert: I’m definitely sold on that, now. I proofed the yeast in water that was hot, but not scalding, to the touch. I say it’s “shower” hot. That’s right around 110-115 degrees, and it’s great for waking up yeast. While that’s getting foamy and frothy, I added the other ingredients to a bowl. The last bit was to add the yeast/water mix. I stirred it all up, and found that it was just the right hydration, this time. I started kneading it on the countertop, and I found I didn’t need to add any more flour in the process. I say, “this time”, because different flours and different humidities can mean that the flour will absorb more or less water. You just never know. I set it in a greased bowl, covered with cellophane, in the fridge. I knew I wasn’t going to use it until today, and I wanted it to have a long, slow, flavor-developing rise overnight in the fridge. Then I went and played cards with some friends. Today, after church, I pulled the bread dough out of the fridge and set it aside in the kitchen, to come up to room temperature. I also lit up some coals, and put the lightly oiled 10” dutch oven on some coals to season and heat up. Once it was smoking a little bit, I put in the sausage, the bacon, and the pepperoni pieces. I used link pepperoni and cut it into small chunks, but you could use sliced pepperoni. I’d still probably cut the slices in half or into wedges. The sausage cooked, the bacon crisped, and the pepperoni browned. Once the meat is all done, pull it out, but leave the drippings. Sprinkle in the flour and stir while it cooks into a roux. Pull it out as best you can, and then toss in the first set of veggies to sweat and sautee. Keep the oven hot all along the way with fresh coals, if you need to. Finally, add the tomatoes and the water, then bring the meat and the roux back in as well. Let it boil, at first, then simmer, covered. Give the tomatoes time to dissolve as much as possible. Maybe as much as an hour. It should be nice and “sauce” thick. If it’s still to runny at that point, let it cook a bit longer with the lid off. Taste it all along the way. I’ll bet that with all of the sausages and bacon, it won’t need much salt, if any, and probably not many other seasonings. Some lemon juice might have been great, in retrospect. Once the sauce was done simmering, I poured it out of the Dutch oven, into a bowl right away, so that the tomatoes wouldn’t eat away at the patina. I dumped the bread out onto my floured countertop, and cut it into halves. In retrospect, I’d suggest quartering it. Each piece should be stretched out wide and thin. I put a generous amount of sauce over one half of the dough circle. I piled it on, but left at least a half inch or so to the edge of the dough. 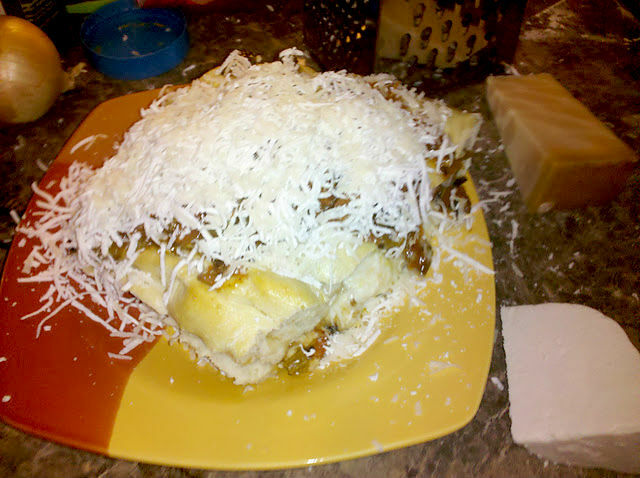 I put a generous amount of shredded mozarella on top of the mound of filling. I brushed some freshly beaten egg onto that edge of the dough, as a sealer. I folded the dough over, and began pinching and curling the dough halves together. Finally, I gently lifted the finished calzone into the oiled 12” Dutch oven. I did that for the other calzone (or the other three, if you take my earlier advice). Hopefully, there should be a good amount of sauce left over. Then, I brushed all the calzones with the beaten egg, giving a good coating. I let that dutch oven sit, to let the dough continue rising a bit. In the meantime, I’d been starting up some additional coals, and I put those on the 12” lid to heat it up. After the lid was really good and hot, and the dough had proofed just a little bit, I set a ring of coals below the Dutch oven, and set the lid with the coals on top. I watched, and maintained the heat with fresh coals, as needed. I took the bread temperature by sticking the thermometer down in between the calzones, where the crusts grew together. Taking the temperature of the filling was kinda pointless, as it was all completely cooked already. I let it get overly done, because I wasn’t sure how it would react to the filling. That turned out to be a good thing. It was done perfectly. Serving was easy. I cut the two calzones apart, and cut each one in half (that’s why I thought it would be better to make four of them instead of two larger ones). I served one half, with more sauce drizzled over the top, and with a garnish of chopped parsley, and the grated cheeses. It was big, filling, and an incredible taste!